Can you dye your hairs? ONLY virgin hairs in natural color can be dyed without any problem. Note: Color 1 and color 1b hairs can't be dyed because they are dyed by our workers with the black dying materials. These wigs have a great colorfastness to make sure the hair color doesn't fade badly when u wear it! Other colors hairs may be colored by our customers successfully, but we don't recommend u do that since the hairs are dyed once by our factory. The second dying process will let hair tangle and dry and easily break! 1. Brush out your wig or extensions gently before washing. Use a soft-bristled brush to remove any tangles. 2. Shampoo your extensions. Sweat and dirt cause tangles, so you should wash your hair regularly. Slowly wet your hair while taking a shower. Use a mild shampoo and lather your hair in a downward motion. 3. Wash your wig with a hair cleanser or mild detergent. Gently place your wig in a tub filled with cool water and allow the wig to soak for five to ten minutes. Rinse the wig with cool water when finished. Allow your wig to air dry by placing on a mannequin head so it will dry in its natural shape. Do not brush your wig when it is wet. 4. Brush your extensions or wig gently after washing. Using a soft-bristled brush or a wide-tooth comb, brush your hair two to three times a day to prevent tangles. 5. Spray the hair with a leave-in conditioner daily to help prevent tangles. You can also use a de-tangling product or silicon spray to help your hair extensions and wigs stay tangle-free. 6. Tie your hair extension up when sleeping or exercising to prevent tangles. Wear a swimming cap when swimming. If you have a wig, you should remove it when sleeping, exercising or swimming when possible. 7. Avoid heat, such as curling irons or hair dryers. Do not blow dry your wig and use heat sparingly on hair extensions. Co-washing your virgin hair before installing is a very important step!When Co-washing, only use conditioner to wash the hair. After Co-washing allow the hair to hang and fully air dry. april wefts are durable and re-inforced to avoid excessive shedding, if you desire an extra level of protection, you may seal your wefts for added protection to your investment. how to test human hair and Synthetic hair? It is easy to see this for yourself when you receive your product. 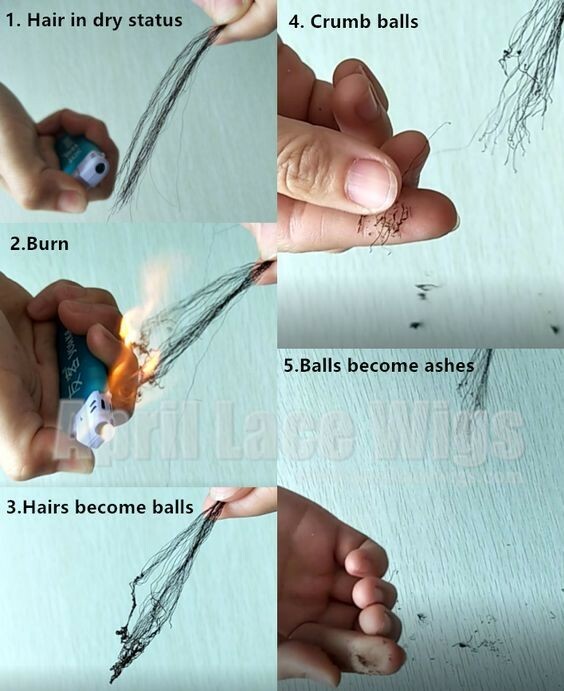 Simply remove a few strands of hair and burn them. What's the density of your wigs? All our stock lace front wig and full lace wigs are 120% density. 360 wigs has own density description. When hair is tied to the lace, a knot is made to secure the hair in place. Bleached knots are hand- tied knots that have been lighten to appear less noticeable. the bleached knots can't give you complete undetectable knots. If you like complete undetectable knots, you should choose Silk top! The silk top consists of a layer of lace and silk fabric on the top front of the cap. When the hair is knotted, the knots are below the silk concealed between the layers, the hair is then injected through the silk material making the knots 100% invisible giving the illusion that the hair is actually growing out of your scalp. There is no other ventilation technique that creates a more flawless appearance than hidden knots on a silk top, you don't need to bleach the knots, you don't need to worry about any other techniques to make the knots invisible or less visible. How long it takes me for the shipping? After we ship the order, 3-5 days to USA, Canada, and Europe, Australia, and 5-7 days to Africa.